Thirteen years ago today, the Poetry Translation Centre was officially launched at the School of Oriental and African Studies in London. Our launch event, entitled 'An Evening of International Poetry', featured poems written in nine different languages, from nine countries, which had been translated at collaborative translation workshops led by the poet Sarah Maguire. The poems were read in their original languages, as well as in English by leading UK poets who contributed their literary stardust! 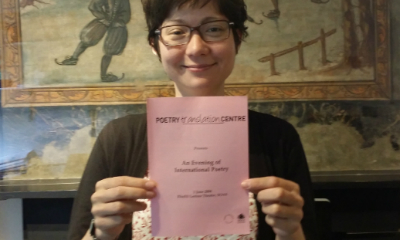 As Sarah wrote in the event programme, the launch of the PTC represented 'an extremely exciting development for poetry in Britain, both for poetry written in English and especially for the astonishingly rich and diverse poetic traditions vital to the many communities now established here'. We were founded on three big ideas: making excellent contemporary poetry from around the world available to English readers; enriching English poetry itself through the practice of translation; and getting to know the UK's many immigrant and diaspora communities, not always well represented in the arts, who actually place a high cultural value on poetry and poets. Thirteen years later we are still going strong. We have just announced our 2017 Summer Tour, featuring Kurdish poet Bejan Matur, Armenian-Turkish poet Karin Karakaşlı, the brilliant British poets Jen Hadfield and Sarah Howe, and Turkish bridge translator Canan Marasligil. Just like at our very first event, you'll hear poems in their original language and in exquisite new English translations. We'll be celebrating the launch of two new PTC chapbooks, History-Geography by Karin and If this is a lament by Bejan, which will be hot off the press. Our tour dates include London, Norwich, Stratford and Ledbury - please do come and join us, and meet our wonderful poets. Here's to another great year of celebrating international poetry. Happy birthday to the PTC!